Perry gets a phone call from a woman with some bare facts. Arlene Dowling was sunbathing when her house trailer and all her belongings were stolen. She�s calling, wrapped in nothing more than a towel, from a golf course. Perry gets in hot water with Arlene. He starts out looking for her trailer, ends up defending her for murder, and is indicted for perjury for his efforts. CARS: 1957 Ford Skyliner retractable, black, top up (Mason), 1957 Dodge Custom Royal Lancer convertible, medium color, top up, 1957 Lincoln, 4dr sedan, black, 1957 Ford Fairlane, 2dr hardtop, black, 1957 Ford 2dr sedan, black. From The Cars by Greg Cockerill. Goof: In that scene where Perry is driving along with Arlene and the cops are following them, the view out of the rear window doesn�t match that in the rear view mirror. Submitted by daveb, 4/21/2007. +Also, the view is backwards. That is, a mirror image would be reversed from normal view. What we see in the mirror is the same as what would have been seen through the rear window. Submitted by Wiseguy70005, 1/22/14. Perry�s office number, MA 5-1190, makes its second appearance, this time actually for Perry�s office. George Ballard, reading a newspaper ad, says it aloud. The very similar MA 5-1199 was previously used as Tydings and Dawson�s office number in #14, TCOT Baited Hook. Perry�s number MA 5-1190 was used for the police department number in #15, TCOT Fan Dancer�s Horse. Submitted by D. A. Supernaw, 6/30/2005. Edited by alan_sings, 10/01/2010. It is extremely rare for us to hear and see a real brand-name in a PM episode (At 7:21 of the CBS/Paramount DVD, Perry says the name as he dictates the ad to Della, then we see the ad in print, linked-to in Supernaw's para above). Was this explicit Product Placement in lieu of a "Supplied by..." trailing-credit? (Another real brand-name, "Thunderbird", is spoken twice in Ep#77. "Rolls-Royce" and "Rolls" are spoken a total of five times in Ep#198.) Submitted by Gary Woloski, 1 Apr 2012. +In the 1955 novel, the trailer was a Heliar, "last year's model" which would be about 1954. According to Wikipedia, the term mobile home was not in use before 1956. Submitted by Wiseguy70005, 1/22/14. Goof: In the scene where Arlene is sitting in a car listening to a radio broadcast, the radio announcer mistakenly says that the police are searching for the murderer of Frank Ballard, rather than George Ballard. Submitted by Bob H, 1/26/2008. Goof: I checked IMDB.com to see if there were any entries for this episode and found one to be correct (watching MeTV) and not yet posted here. I can't believe that I probably would have missed it! At the end, during the time Perry and Della are sitting at a restaurant booth, look as Della wipes her lipstick off Perry's cheek and she moves to place the check in her bag, Perry's left arm is high up on the booth back behind her head, but in the very next shot as Perry says "Amy" he is suddenly leaning on both arms on the table...then Burger comes in next for breakfast to eat some crow! LOL! Submitted by mesave31, 04/13/15. This episode is unique in that Perry is forced to take the oath and testify. Submitted by PaulDrake 33, 2 September 2008. Arlene Dowling�s trailer was stolen by Tom Sackett, played by Paul Brinegar. Paul Brinegar was best known for playing Wishbone for 6 seasons on Rawhide. Submitted by PaulDrake 33. Carl Betz makes his only Perry appearance as Dr. Chandler. Carl Betz is best known for playing another doctor, Dr. Alex Stone, husband of Donna Reed on The Donna Reed Show. 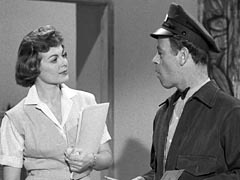 Carl Betz was also one of a handful of Perry alumni to appear in The New Perry Mason, �TCOT Spurious Spouse.� Submitted by PaulDrake 33, 23 May 2009. Revised 21 October 2009. +Coincidentally, Carl Betz had his own defense-lawyer show some years later, playing the title character in "Judd For The Defense." When Arlene leaves George Ballard�s house and gets back into Dr. Chandler�s car she says, �I wasn�t too long, was I?� and Dr. Chandler says, �Just long enough for me to finish my cigarette.� This is an ironic line since lung cancer killed Carl Betz at the age of 56 in January 1978. Submitted by PaulDrake 33, 23 May 2009. Perry receives a 500- and 1000-dollar bill by special messenger. William McKinley is on the 500-dollar bill, and Grover Cleveland is on the 1000-dollar bill. The bills seem to be real as you can see the reverse of the bills and there are no pictures on the reverse. The 500 and 1000 do not have pictures on the reverse, only numbers and scrollwork. All bills above 100 dollars were withdrawn from circulation by President Nixon in 1969. Submitted by PaulDrake 33, 23 May 2009. Uncredited Actors: Don Anderson appears with Lee Miller (in a non-Sgt. Brice role) here. As Paul Drake watches and waits to talk to a uniformed bank guard, Anderson and Miller play bank employees loading money bags into an armored car. Submitted by FredK, 30 September 2010. + This episode marks the first Perry appearance of an Australian actor sometimes credited (though never in this show) as Major Sam Harris (Ret.) A.L.H. [Australian Light Horse brigade]. He is the foreman on the grand jury, or so reads the sign in front of him. There are a few clear and lingering shots on him, especially when Perry makes a shocking declaration or two. Submitted by gracenote, 9/4/2011. + Bert Stevens plays the court reporter during the trial. Submitted by gracenote, 9/4/2011. Sightings: Lots of folks from the �Who Is That?� page appear today. In the same scene as the item above, the man who drives the armored truck and impatiently toots his horn is Blue Collar Guy. The guard addresses him as Charlie. In the next scene, the man cleaning the pool table in the billiards hall and giving directions to Perry is Distinguished Gentleman #2. Later, Distinguished Gentleman #1 plays the stenographer at the grand jury hearing. At trial, he loses his toupee and plays a juror. Additionally, Distinguished Lady #2 plays the matron guarding the defendant, while right behind her sits Distinguished Lady #4. Submitted by gracenote, 9/4/2011. + (Also Continuity Error:) While playing a juror, the same bald Distinguished Gentleman #1 magically plays a spectator in the gallery. Right in front of him is The Thin Man. (Clearly seen when Dr. Chandler is called to the stand). Submitted by gracenote, 9/4/2011. + The aforesaid Gentleman reappears one last time at the restaurant in the final scene. Syndication cuts: The entire scene where Arlene calls Perry from a golf course; a messenger delivers $1500 for which Gertie signs [Gertie, again, is completely cut out]; Mason phones Dr. Chandler but speaks to his nurse who refuses to call Arlene; Chandler meets Arlene in the woods suggesting she not flee to Canada but to see Mason. Additional Hallmark cuts: Della gives Mason the $1500 which was delivered and Mason instructs Della to tell Paul to dig up everything on the Mercantile Security theft; part of Perry and Della's phone conversation where Della reads Arlene's letter; Burger tells Mason he's at the Grand Jury hearing as an ordinary citizen who witnessed a murder and not an attorney and Mason says he didn't; another part of the testimony about Arlene's fee and handwriting; scene with Della and Mason before Paul arrives discussing Burger's next move and locating Arlene; Mason offers to explain the circumstances of the case but Burger refuses. Submitted by Wiseguy70005, 7/06/12. The closing credits of this episode has the smaller law books in the lower left hand corner with the space there for the sponsor's product placement. Submitted by Wiseguy70005, 7/07/12. Goof: When Perry is testifying in court he says "May I direct your attention to Dr. Chandler." There is then a shot of Arlene Dowling and Dr. Chandler looking at each other. Right before Perry starts talking again, you can barely hear (turn the sound up) someone--evidently the director--say "action." Submitted by Alan Smithee, 3/28/2014. "Doctor Who?" In the original ESG novel, the modestly named Dr. Ralph Chandler's full name is Dr. Holman P. Candler, one of ESG's more creative Pitkinesque efforts. Submitted by BobH, 9 July 2018. That $400,000 in stolen money would be worth about $2,867,800.83 today. The $1500 that Mason charges Arlene to find her trailer would be $10,754.25. Definitely a bit over the top as Della comments. Actually, although I realize Perry was testing her, I think he�d get in trouble today with the bar association if he did that. Arlene pays $2500 ($17,923.76) for her trailer and finds $18,000 ($129,051.04). Perry gets a $25,000 ($179,237.55) reward which he turns over to Arlene and her father. The way that girl spends money, she�ll need it. Submitted by billp, 12/27/2008. +Bill Emory states "the robbery took place on Tuesday, May 3rd". This episode was part of the 57-58 season. May 3rd was a Tuesday last in 1955. But Bill Emory has only been fired for the past 10 months. Submitted by PaulDrake 33. 13 April 2015. + This episode was unusual in that the murder seemed gratuitous, and as such morally unsatisfying: as has been argued, the victims are traditionally vile persons, or in a few cases - such as Sleepwalker's Niece, where the killing is integral to the plot - the character is (simply) undeveloped; but here neither is true: Uncle George is a nice guy and little reason - perhaps no reason at all in the syndicated versions - is given for his death...but it's PM so we know "someone's gotta get it", sentiment be damned. Lamented by Notcom , 082417. Tragg arrests Arlene and says the trial is the next day. In court both Perry and Burger have miraculously developed their cases. In fact, Burger says "the state has gone to a great deal of trouble to prepare its case". Those are two fast working attorneys! Submitted by Kilo 3/7/2018. > Ah but we find out (see below) that's not really true...the pitfall of rushing things!! Notcom 120718. Odd that Burger was unaware that Perry didn't lower and raise the shade as a signal when he questioned Perry in court. Tragg knew that when Perry tried to show him why he did it. Apparently Tragg kept that information to himself. Kilo 12/7/2018. Perry placed a want ad in the paper as a way to locate the trailer. I guess we are to assume Mr. Hartsel at the Ideal Trailer Mart responded to the ad. Kilo 12/7/2018. Too Many Fairlanes! (See Greg C's CARS Trivia) We see Perry driving his black 57 Ford Fairlane Skyliner (Lic No HGA 056) into George Ballard's driveway in daylight at 21:50 of the CBS/ Paramount DVD. The Skyliner nameplate on the side of the roof is conspicuous. At 26:59, it's dusk and the police lurking across the street in their own black 57 Ford sedan observe a man who they ID as Perry leaving Ballard's house and driving off in a black Fairlane. . . But Hey!... The cops don't notice that it's not Perry's car! The Lic No is MNN 527 (or 521) and it's a Fairlane 2-Door Hardtop! - note how the rear roofline differs from that of the Skyliner. This misidentification is an important story element and one of the most devious & delicious plot devices in any PM episode. I doubt that a Jeep could pull Arlene's large trailer out of the woods but there are contrary claims! Even so, any cops spotting Sackett on the road would have stopped him for the excessive (stolen) load. Toaster, lamp & AirCond are seen in Arlene's trailer but Sackett didn't disconnect electrical service. Since Sackett didn't stow anything, the interior would have been wrecked by the time he got to Ideal Trailer Mart. Arlene would have had great difficulty getting her trailer into that wooded, sandy spot, even with her big Dodge Royal Lancer, (Lic No MLJ 766, see "1957 Headlight Oddities" at ep#3 Comments). Added by Gary Woloski, 4/8/12.